Or if you want a higher level view on the differences between sold panel brands, then in the video below I go through 3 simple things you can look out for when comparing. If you are in a hurry, just watch this and you'll massively reduce your risk of buying a crappy panel that won't last. After the video I go into even more details if you are feeling like getting knee deep in solar panel comparisons! There is a bewildering array of solar panels on the Australian market. At the last count there were over 10,000 models approved for use in Australia! If you look at a solar panel specification it can often look like a physics textbook, full of numbers and strange symbols. For those of us that haven't got a degree in rocket-science, how do we make an honest solar panel comparison? Well, I reckon there are 6 things you need to look at when choosing solar panels for your home to maximise the chances you are getting good quality products. But first, let's get one thing out of the way that doesn't matter: whether the panel is monocrystalline or polycrystalline. Despite what a lot of salesmen will tell you, these days there is very little difference between mono and poly panels. 1) Tier 1, 2 or 3: Do you want high, medium or bottom end panels? Solar panel manufacturers are ranked into 3 tiers. Tier 1 are the big brand panels with a good reputation for quality and performance. If you are building a large-scale solar power station, your investors won't go near you unless you use a Tier 1 solar panel. Getting a panel from a Tier 1 manufacturer is pretty low risk. Just be aware of less-than-honest salesmen that will insist that their panels from ChengZongAmeriWaWaSuperFangleSolar are definitely Tier 1, Honest Guvnor! Tier 1 manufacturers include: Suntech, Trina, Canadian Solar, SunPower, Renesola, JA Solar, Hanwha QCells and REC to name a few. Tier 2 and 3 manufacturers are the smaller players who make panels. You can get some good Tier 2 & 3 panels but, unless you really know the solar manufacturing landscape, it is a lot riskier. Because 80% of the lower tier panels are junk. You really have to know your solar panels to pick a good quality Tier 2 or 3 panel and avoid the rubbish. Also, the smaller companies are less likely to be around in the future. For those reasons, I always recommend the non-solar expert to stick to Tier 1 panels. You can read more about the tier ranking system for solar panels here. Be aware that all solar panels come with 2 warranties. The "performance" warranty and the "manufacturers" warranty. Generally the performance warranty is 25 years – and I've never seen a solar panel that hasn't got a 25 year performance warranty! Ignore this warranty. It is so easy for the manufacturer to get out of that it is worthless. The warranty that matters is the manufacturers warranty – so this is what you should compare on. Don't buy a panel that has a manufacturers warranty of less than 10 years. This is how close to the specified wattage the panel can be in real life. For example, if it is a 250W panel and the power tolerance is +/-5% your actual wattage could be from 237.5W up to 262.5W. These days good panels have a "positive only" power tolerance. That means a 250W panel will never be less than 250W. That's a good thing. My advice is: only buy a solar panel that has a "+ve only" power tolerance. And ask for a 'flash test certificate', which proves that the power tolerance is real – and wasn't just slapped on there by the marketing department. When comparing panels, efficiency is not as important as most people think. As long as the panel efficiency is over 14% it should be fine. More efficient panels don't produce more electricity, they are just a little bit smaller on your roof. Unless roof space is critical, don't stress about efficiency. Solar panels love sunlight, but they hate heat. Their power drops as they get hotter. The temperature coefficient measures how much the power drops for every degree rise in temperature. It generally ranges from -0.4% per °C (good) to -0.5% per °C (not as good). In the latter case if the panel temperature goes up 20°C, the power will drop 0.5 x 20° = 10%. 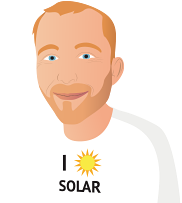 The performance ratio is, in my opinion, one of the most important things you should look at when performing a solar panel comparison. It is simply a percentage that tells you how much power you can really expect to get from the panel, compared to the manufacturer's specification. For example a 250W panel with a performance ratio of 90% will only give you 225W in real world conditions. It is a nice number to know because it takes into account the temperature coefficient, so you don't have to. And even better than that – if you use the performance ratios in my solar panel comparison chart, all the performance ratios from "Californian Approved" panels are independently calculated by our friends in California, so they are a lot more trustworthy than if they were calculated by the manufacturers. Generally a performance ratio of over 90% is pretty good. Over 92% indicates an excellent quality panel in this regard.